Guillermo Rojo De Diego was appointed General Manager of Trinidad Cement Limited effective February 6, 2019. Prior to this, he held the position of Country Manager at CEMEX, Guatemala. 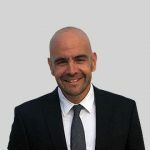 He is a strong sales professional and an experienced Country Manager with over twenty years of working in the building materials industry across three continents. Since joining CEMEX in 2000, Mr. Rojo De Diego has held the positions of Mineral Resources Expert (Spain); Plant Manager – HORMICEMEX (Spain); Project Manager – Strategic Planning (Spain); Commercial Director – Cimenti Siciliani (Italy); Board President – Ciments Blancs du Maroc (Morocco); Managing Commercial Director (Spain); Country Manager (Guatemala). He holds a B.Sc. in Geological Sciences specializing in Mineral Resources from the Universidad Complutense de Madrid, Spain; an MBA from the Escuela de Organizacion Industrial (Spain) and an INSEAD MBA (France).